Written With A Sword: Author Interview & Feature: MARK LAWRENCE! Author Interview & Feature: MARK LAWRENCE! It’s one thing to make your readers smile, laugh or even cry. But, to inspire revulsion, abhorrence, outrage…that’s a whole other story. It’s a morbid fascination that keeps the pages turning, word a blur as you descend into the depths of depravity. Good and evil, black and white. But, when there’s little good and a hell of a lot of black, that sick obsession needs its fix. Mark Lawrence is a dealer to this addiction. He writes with a dark intellect; witty to the macabre, each line laced with a bittersweet poison. What makes his stories so delightfully compulsive is that he dares to tread the thin line between what can be said, and what should never, ever, ever, even be thought. At the reins of a first person Point-of-View, the reader is not just invited to the blood written tales of his creation, but dragged along, kicking and screaming. Combine a poetic psychopath with a power-hungry philosopher, and you have Mark Lawrence’s leading man. 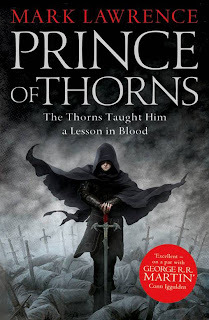 Prince Honorous Jorg Ancrath…The Prince of Thorns. ‘Is it true that we need to be broken before we can be reborn? No. But bleeding can sure do the trick. Thorns can bleed you better than a knife. Briar thorns so deep they hook to the bone. Where a knife goes in and out, you go in and out of a thicket. The knife goes in, blood comes out. You go in…who knows what comes out? But, I did. Before the thorns, before the person that I am now, I was a son and a brother. I’m still a Prince, but I gave that up for the road. Being a son and a brother was taken from me. The thorns gave me a new family. Brothers, though not by blood, but they’ve spilled enough of it for me. Yet there’s more blood to run, and though I lost my old family, I still have a claim to the family fortune. ‘In chess, there are pawns, knights, queens, bishops, and more. But, there are no Princes, so in this Game I have become a king. Chess is black and white, which suits me rather well. A black king. But where's the read? There should be red, a lot of it. A lot of red, a lot of blood. Because, I've played all my pawns for check mate. I've got one castle, one knight, a queen and a king on my side of the board. But, there's six boards against my one side. Surely that's against the rules? Why am I complaining, I've never been one for rules, or played nicely with others. Maybe being the king isn't all it's cracked up to be? Despite the darker than dried-blood saga, Mark Lawrence is a genuinely nice guy. If I sound surprised, then I guess I am a little. It’s like when you’re a kid and you look up to Superman only to realise he’s just an actor (personally, I never looked up to Superman. Dude couldn’t even dress himself in the right order – I mean, pants…on the outside? Please! Wolverine was my personal favourite). Now, I’m not saying that it’s a bad thing that when I spoke to Mark Lawrence he didn’t immediately slaughter me (unless I’m being unwittingly groomed for that eventuality! ), but I’d built him up to be a big nasty. Boy was I shocked when I found out that he was an awesome bloke, more than happy to chat with a star-struck fan! Mark is a father of four, one of whom is severely disabled. On his ‘About the Author’ he mentions himself as an allotment tender….scary stuff?!? So what makes a nicer than nice do-gooder turned to the dark side, besides for the cookies? Well, I was lucky enough to ask Mark a few questions! As a research scientist, your job is very much fact. Why then did you decide to write a fiction book, particularly fantasy? Not an uncommon question but still one that strikes me as peculiar. Most people’s jobs involve fact. Who gets to sit around making stuff up for a living or not obeying the laws of physics? Absolutely no reason a research scientist shouldn’t write fiction, any more or less than a bus driver or hairdresser. A scientist is called on to be far more creative than most people are in their day job. Fantasy was an early love of mine – I was read Tolkien at an early age. How did you get into writing, and how long have you been writing for? I started writing scenarios for dungeons and dragons games when I was eleven. I ran a fantasy play-by-mail game for a year between my physics degree and my Ph.D and continued to run it in my spare time for the next ten years. When I moved to the States and stopped running the PBM game I started writing short stories for fun. Short stories grew into longer stories. What(who?) inspires and influences your writing? Is fantasy your first love, in regards to writing? It was my first love as a reader and as a writer but I write sci-fi, horror, literary fiction as the mood takes me. 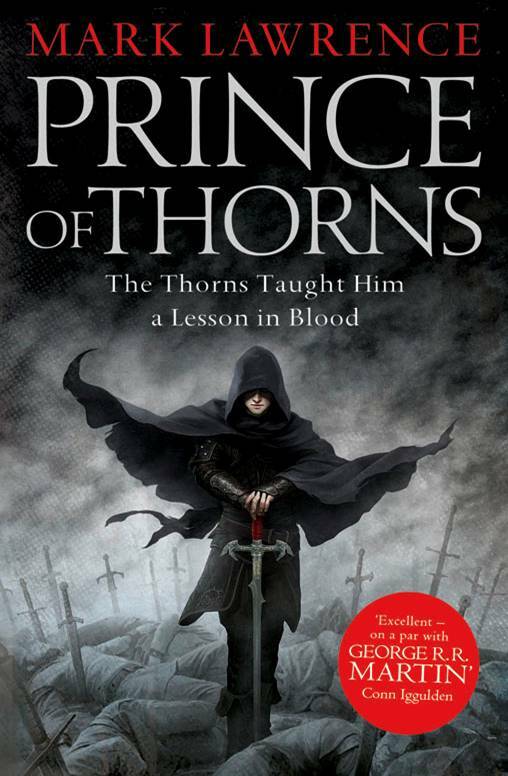 Now, tell us a little bit about your debut novel, 'Prince of Thorns'? A violent sword and sorcery romp with deeper under-currents and a lyrical edge, inspired by Burgess’ A Clockwork Orange. It wholly exceeded them. I just wrote it for fun with no plans to try for publication. Why so dark, why all the blood? Why anything? It’s like me rolling a die and you asking ‘why 5?’. I just started typing and that’s what came up. My writing process is rather like rolling dice. The inspiration for this particular tale always meant there was going to be more than a touch of ultra violence. Prince Honorous Jorg Ancrath...where he did come from? What spawned him in your mind? Burgess’ protagonist in A Clockwork Orange is violent and amoral and does terrible things, and yet we find ourselves drawn to him because of his charm. I wanted to try that in a fantasy setting. Jorg philosophizes, and quotes many of the greats (Plato, Aristotle). Is this a reflection on yourself? Well clearly I know a little about philosophy or I couldn’t have written about it. And clearly I quote philosophers (I did it in the book). But no, if you find yourself in conversation with me I am highly unlikely to start throwing in philosophical references. Can you reveal anything about the third and final book in the Broken Empire series? Not a lot! 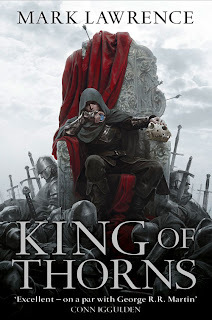 It fills in some of the gaps between the two threads in King of Thorns as well as moving forward from the latter thread toward what’s hopefully an exciting and satisfying conclusion. Do you plan to revisit the world set out in the Broken Empire, or will the end of trilogy close the door? I would like to return to the setting – though not to Jorg. There’s a power in knowing when to stop. I don’t plan to revisit Jorg. I want people to put down the last book of the trilogy wanting more, not to put down book 9 of an endless series thoroughly bored of him. What's next after the third novel? What’s next is seeing if anyone will ever publish me again. And if not, then going back to writing for myself on the weekends. Any advice to would-be writers out there? There’s no would-be about it. Start writing and you’re doing it. If you enjoy it then that’s reward enough in itself and everything else is a bonus. If you don’t ... then stop. Nope, I’m good. I make my thanks along the way. I’ll leave you with a Jorgism. You’re either part of the solution or small and bloody chunks of the problem. And that, ladies and gentlemen, is that! Thank you Mark for taking the time to answer my questions, and thank you readers for stopping by! 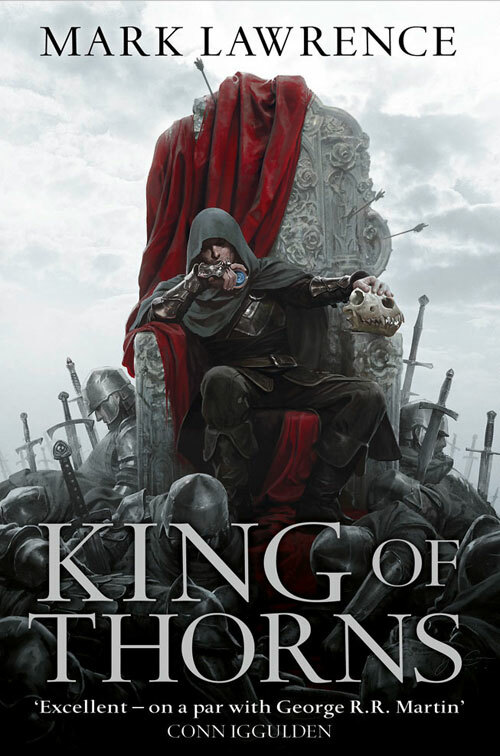 Both ‘Prince of Thorns’ and ‘King of Thorns’ are available to buy as ebooks and paper/hard backs in all major book stores! If you want a book to get you hooked, then be sure not to miss out! Awesome interview! I look forward to reading his work. Nice interview. Mark's an interesting guy. I wish him great success with the series which is already doing so very well. well that's interesting - your italics above have been quoted back at me as lines I wrote. Had to google to find out where they came from!